Turkey’s Minister of Science, Industry and Technology Faruk Özlü promoted the Turkish industry’s efforts in developing and producing unmanned aerial vehicles (UAV). Turkish Aerospace Industries (TAI) and Baykar Makina are Turkey’s main UAV suppliers. TAI developed the Anka medium-altitude long-endurance (MALE) UAV, which had its maiden test flight in 2010. An improved version designated Anka-B flew in January 2015. TAI armed the Anka with the Roketsan Smart Micro Munition (MAM-L) in April of this year, with the TSK using the Anka in combat in July. In regards to the TAI Anka, Özlü stated that the satellite communication (SATCOM)-enabled Anka-S will join the Turkish Armed Forces (TSK) “in the near future.” The Anka-S will connect to the TÜRKSAT-6A communications satellite, which is due for completion in 2018 and launch in 2020. Savunma Teknolojileri Mühendislik ve Ticaret A.Ş. (STM) has also entered the field with its Alpagu, Kargu and Togan loitering munitions. These are lightweight (weighing 7.5 kg or less) UAVs that double as guided-munitions. Besides UAV airframes, the Turkish defence industry has made substantive investments in developing the requisite subsystems, weapons and critical systems for drones. This includes Aselsan’s progress in electro-optical and infrared (EO/IR) sensors and Roketsan’s guided air-to-surface munitions, such as the Common Aperture Targeting System (CATS) and MAM-L, respectively. In October, Tusaş Engine Industries (TEI) reportedly completed the development of the PD170 turboprop engine for the Anka UAV. The PD170 weighs 170 kg and has a maximum speed of 170 hp at up to 20,000 ft (though the engine can provide the Anka flight ceiling of 40,000 ft). This complete chain offers Turkey the opportunity to freely define and pursue its UAV requirements (albeit in line with its fiscal and local technical capabilities) and to export drones, especially to sensitive markets such as the Middle East, which is now a significant buyer of Chinese armed drones. 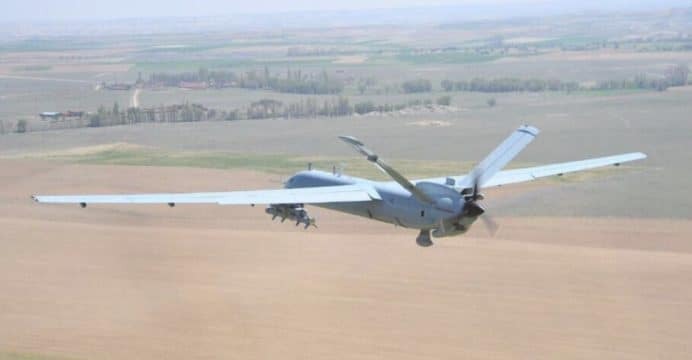 For the TSK specifically, the Anka-S – along with the TÜRKSAT-6A – will be a significant qualitative gain. It will enable Turkey to deploy UAVs at beyond-line-of-sight (BLOS) range for intelligence, surveillance and reconnaissance (ISR) and/or targeted strike missions.